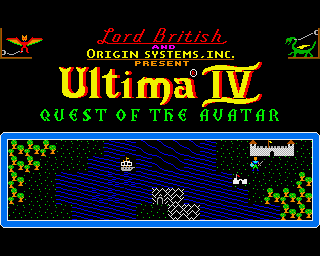 Some time before Final Fantasy or Dragon Quest, Ultima was a popular role-playing series for the PC. I remember being interested in it before, but I never had a chance to play any of the games. The third and fourth games in the series, Exodus and Quest of the Avatar were ported to the Nintendo Entertainment System, and I rented the former, but found it rather primitive. Not at all surprising, considering how early it was, but you’d think they might have souped it up a bit for the Nintendo version. About all I remember was that, if you took a treasure chest in a town, the guards would attack you, and those guys were tough. Kind of a far cry from how most games encourage you to take everything you see. More recently, I purchased Quest of the Avatar through Origin, and played it a bit. It runs on a DOS emulator, which means it works exactly the same way it did on old PCs. Actions are determined by letter commands, so it’s necessary to keep a list of these commands handy. The world, while small, is pretty open-ended, and it’s not always clear what you’re supposed to do next. The basic idea is that you’re transported from Earth into the world of Britannia, where you have the goal of achieving the eight virtues and becoming the Avatar. In order to do this, you must locate the runes corresponding to the virtues and behave morally, which once again means not stealing treasure chests or fighting anyone who doesn’t attack you first. It’s an interesting idea, considering how amoral many game protagonists tend to be. Townspeople will give you clues as to where to go next, and most of them have their own names, but little personality. You start by asking them a few basic questions like what their job is, then type in other words based on their responses. Even so, you’re still going to get a lot of non-answers. The battle system is turn-based, but a little more complex than just entering a command and watching it get carried out. Instead, you fight on a field, and have to move into a proper position to attack an enemy. While you have to be standing right next to a monster to fight them with a melee weapon, a ranged weapon lets you attack from any distance as long as you’re in a straight line from them. The enemies will also move around, sometimes coming toward you to attack, and other times running away. There are seven party members you can recruit, but so far I’ve only found two. I also have yet to test the magic system, which is rather complicated and utilizes alchemy. While it seems like this is one of those early games where creativity outweighs playability, it’s still pretty fun to visit for brief periods of time. 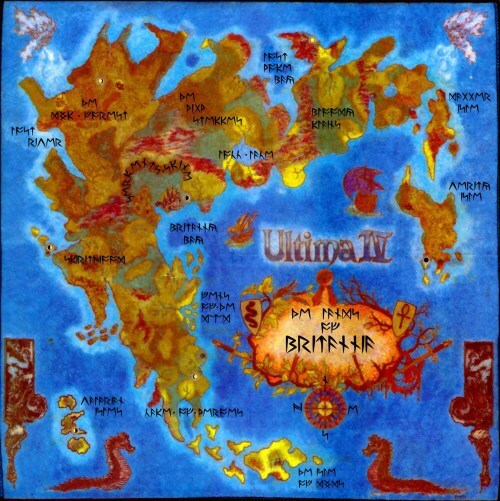 There are nine Ultima games (not counting Ultima Online and other spin-offs), released from 1981 through 1999, all taking place in order. The first three take place on a world called Sosaria, which after a cataclysm became known as Britannia after its ruler, Lord British. Based on a nickname for series creator and developer Richard Garriott, the in-universe character traveled to Sosaria through a magic gate from Cambridge, and was dubbed Cantabrigian British by his friend, the ranger Shamino. From what I understand, the first three games are dungeon crawls with an ultimate evil at the end, while the fourth starts a trend toward more of a story and more influence on the player’s behavior. 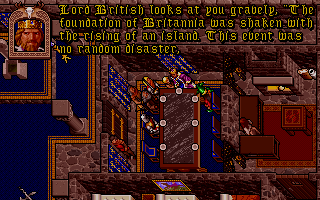 This entry was posted in Uncategorized, Video Games and tagged britannia, lord british, richard garriott, sosaria, ultima iii: exodus, ultima iv: quest of the avatar. Bookmark the permalink.